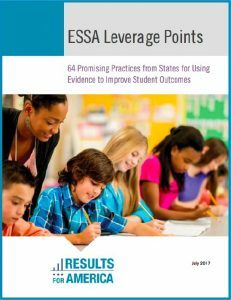 In July 2016, Results for America (RFA) launched the Evidence in Education Lab (Ed Lab) designed to help states, school districts and schools build and use evidence to improve outcomes for our nation's students. In December 2017, Ed Lab expanded its work with the launch of the State Education Fellows program. Through the Ed Lab, RFA is helping state and local leaders implement the ground-breaking evidence provisions in the bipartisan Every Student Succeeds Act (ESSA), which was enacted in December 2015. 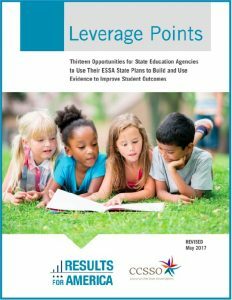 ESSA could help shift more than $2 billion annually in federal education funds towards evidence-based, results-driven solutions in each of the next four years (FY17-FY20). Results for America’s State Education Fellows program, founded in December 2017, is helping 27 state education agency officials from 13 leading states implement the new evidence provisions in ESSA to improve education outcomes for all their students. Results for America is also supporting state education leaders in targeted states to incent and drive school districts and schools to build and use evidence to improve their lowest-performing schools. RFA’s Evidence in Education Lab is helping state leaders use their new authority, flexibility, and resources under the Every Student Succeeds Act (ESSA) to increase the amount and quality of evidence created and used by their school districts and schools and drive better outcomes for millions of students across the country. 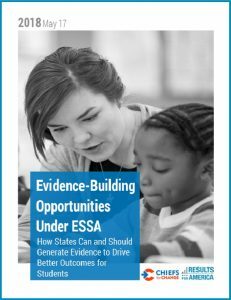 In May 2018, Results for America partnered with Chiefs for Change to release a report on how states can (and how many states already are) seizing the opportunities within ESSA to build evidence about what works to help students succeed. As part of the Ed Lab, RFA conducted in-person and online briefings and developed numerous written materials designed to help all states and school districts use ESSA’s evidence provisions to help them solve their biggest challenges. See our suite of resources that outline the potential and promise of ESSA’s evidence provisions to help state and local leaders improve K-12 education. As part of the Ed Lab, RFA has developed a suite of online resources that outline the potential and promise of ESSA’s evidence provisions to help state and local leaders improve K-12 education. ESSA Evidence Fact Sheet: A brief 2-page description of the evidence provisions in ESSA. Evidence in ESSA Explainer: A brief visual graphic of the evidence provisions. ESSA Evidence Power Point: Everything you need to know about ESSA’s evidence provisions, including: a description of the opportunities in ESSA, a description of the evidence provisions, actions states and districts can take, and a review of school improvement requirements, all in an easy-to-read PowerPoint deck. ESSA Evidence Provisions: An exhaustive list of every evidence provision in ESSA, including the section in the law where it occurs. Webinar with AASA: “Leveraging ESSA’s Evidence Provisions to Help Every Student Succeed.” This webinar is designed for superintendents and school leaders to help them carry out the ESSA evidence provisions. Meet the State Education Fellows: More information on the senior program and evaluation leaders participating in RFA’s State Education Fellows program.